Never met a polar bear? Ice Bear, Giant of the Arctic, Lord of the Arctic. The Inuit call them pihoqiaq, the ever-wandering ones. 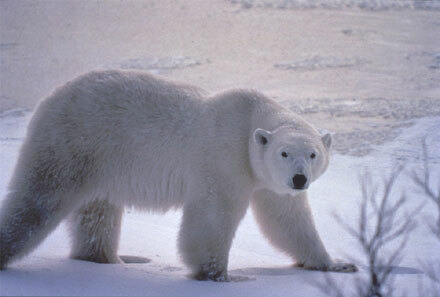 By whatever name, the polar bear is a true symbol of Canada's north. Throughout the fall and up until just before Canada's Hudson Bay freezes, large numbers of polar bears gather together along the coast until they can move out onto the frozen ice of the bay and begin feeding. On the east bank of the Churchill River where it empties into Hudson Bay, stands a small remote and ruggedly beautiful village of about nine hundred people. Churchill, over 1700 kilometres (over a 1000 miles) northeast of Manitoba's capital city of Winnipeg, is where a historic trading post of the famous Hudson's Bay Company and the Prince of Wales Fort once thrived. It is a major grain-handling port, but eco-tourism has come into its own and nowadays the Polar Bear Capital of the World attracts people with a taste for the wilderness and the wildlife. Visitors come from all over the world to see Churchill's natural wonders&emdash; the amazing Northern Lights, masses of migrating birds, huge pods of beluga whales and the annual congregation of the polar bears. Churchill is connected to civilization by VIA Rail on one of the longest railway lines in the world. Aboard VIA Rail's Hudson Bay the journey from Winnipeg to Churchill is in Northern Spirit sleeper cars, which feature comfortable bedrooms or roomettes, Manitoba cuisine in the dining car and striking scenery outside the train's windows. Come along with John Steel Rail Tours for an adventure in Manitoba's north where the polar bears play by day and the Northern Lights dance across the sky at night! Explore the region in a helicopter, in a tundra buggy and on a dog sled! To find out more about this unique wildlife experience, Churchill Northern Adventure, and other John Steel Guided Group Tours and Independent Holidays, contact the friendly and knowledgeable Tour Coordinators at 1-800-988-5778 or info@johnsteel.com. Visit the website at www.johnsteel.com. About Our Company: Located near Vancouver, BC, John Steel Rail Tours is in its fifteenth year of creating unique guided and independent Canadian rail journeys for groups and individuals. We specialize in Canada and take extra care to provide our guests with rail travel expertise and personalized service second to none. Registered by the Government of British Columbia, Canada. Reg. #2042-5.